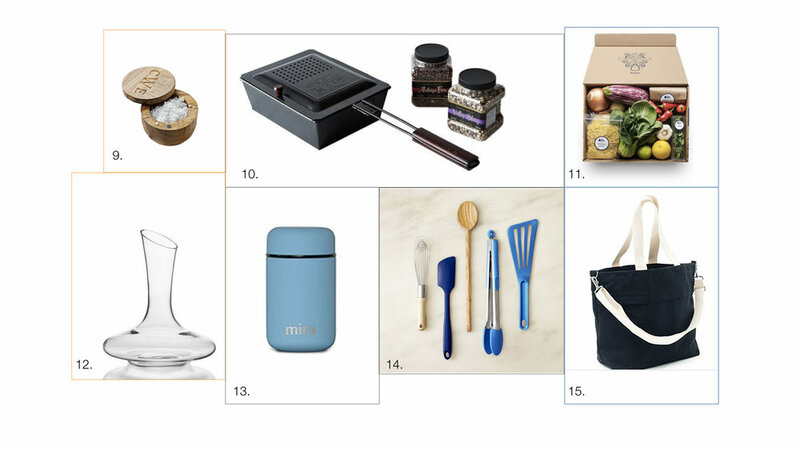 Dec. 13: (Not Just Any) Foodie Holiday Gift Guide — F&Co. We’ve scoured content to compile a list with something for everyone, from eaters to food inventors and everything in-between. Enjoy, and Happy Holidays! The right gift is something that’s stored in the kitchen and helps make something delicious. Simply gifting delicious food can work as well, just remember, this group will travel for a deeper culinary experience and they like to roll up their sleeves and create. 4. Come on...what self-respecting food person doesn't like delicious meat? : It’s Pat! 7. Makes smoothies and veggie spaghetti—BOOM: Veggie Bullet, you’re welcome. They might not be as dialed-in as the ‘Full-ons’, but their fingers are on the pulse of the foodie lifestyle. Tools for the occasional (yet still, enthusiastic and meticulous) cook work well for your foodie-lites, culinary experiences too (think: a cooking class). Your foodie adjacent friends don’t really cook. They might like a cooking class (though a wine tasting may be more appropriate). They love what we all love, delicious food and a good time. Here’s your opportunity to expand their horizons—just a bit. *Want your gift to make a bigger statement? Do something spectacular. Make your gift to someone a donation on their behalf and feed hungry kids.